1.Preheat oven to 450°. Cut dough ball into quarters; cut each quarter into thirds. Roll each dough piece into a ball; cut an “X” on top of each ball. 2.In medium saucepan, heat 5 cups water and baking soda to boiling over high heat. In batches, add dough balls to boiling water and cook 30 seconds; with slotted spoon, transfer to a paper towel-lined pan to drain. 3.In small bowl, whisk egg and 1 teaspoon water; brush tops of dough balls with egg mixture. 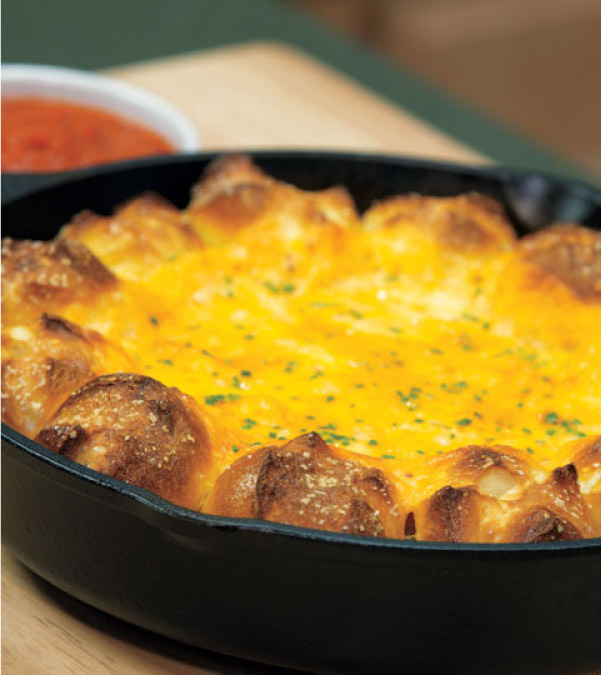 Arrange dough balls around inside of a 10-inch cast iron skillet; sprinkle with salt. 4.In medium bowl, stir cheeses, milk and mustard; transfer to center of skillet. Bake 15 minutes; loosely cover with foil and bake 5 minutes longer. Sprinkle cheese dip with chives. > Serve with marinara sauce on the side for dipping.